He was named a USA Ford Fellow in 2012. Currently professor emeritus in the Department of Native American Studies at the University of Oklahoma, Heap of Birds also has taught as a visiting professor at Yale University, the Rhode Island School of Design and the Michaelis School of Fine Art in South Africa. Before attending the Tyler School of Art, he earned a BFA degree from the University of Kansas in 1976 and attended the Royal College of Art in London. 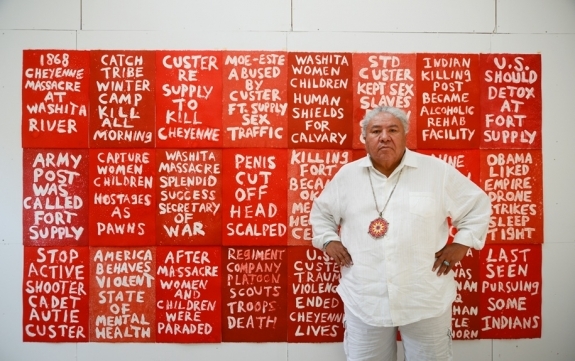 His works have exhibited at The Museum of Modern Art, Whitney Museum of American Art, Metropolitan Museum of Art, New York; Cheyenne and Arapaho Nations Reservation, Oklahoma; The National Gallery of Canada, Ottawa; Museum of Contemporary Art, Sydney, Australia; Documenta, Kassal, Germany; Orchard Gallery, Derry, Northern Ireland; University Art Museum, Berkeley, California; Association for Visual Arts Museum, Cape Town, South Africa; SITE Santa Fe, New Mexico; Hong Kong Art Center, China; Bandung Institute of Technology, Indonesia; Grand Palais, Paris, France; Nanyang Technological University Art Gallery, Singapore; and the Venice Biennale, Italy.